During the last twelve months (July 2003 to July 2004), construction costs underwent an increase of 5.6%. 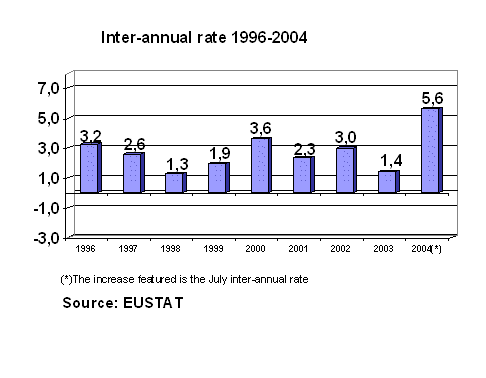 According to EUSTAT data the Construction Costs Index in the A.C. of Euskadi registered an increase of 0.1% in the month of July 2004 compared to the previous month, leaving the inter-annual rate for this month at an increased rate of 5.6%. In July 2004, the labour costs did not undergo any change (0.0%), while the costs of raw materials registered an increase of 0.2%. The Building and Civil Works sub-sectors increased by different rates, with an increase of 0.1% on the previous month in Building and an increase of 0.5% in the costs of raw materials for Civil Works, that is four decimal points more. Analysis of the inter-annual changes in these two sub-sectors reveals that, with regard to the consumption of raw materials, both sectors followed more similar paths: raw material costs in Building and Civil Works increased by 6.5% and 6.7% respectively. The most substantial increases in prices in July occurred in raw materials for the Petroleum Derivatives sector (5.1%), Asphalted Products (4.3%), Metallic Tubes (2.9%), Machinery Accessories (2.1%) and Electric Energy (2.0%). On the other hand, there was a reduction in the prices of the raw materials in Cleaning and Toiletry Products (-3.2%), Plaster and Whitewash (-2.1%), Iron and Steel (-0.9%) and Electrical Material and Apparatus (-0.4%), among others. Featuring among the raw materials consumed by the sectors which undergone higher inflation rates throughout the last twelve months are: Metallic Tubes (38.2%), Iron and Steel (25.2%), Asphalted products (22.1%), Petroleum Derivatives (14.8%) and Articles derived from Cement (7,8%). On the other hand raw materials for Stonemasonry (-7.2%), Cleaning and Toiletry Products (-3.8%), Electric energy (-3.7%), Office Material (-2.1%), Gases and Explosives (-1.0%) Glass (-0.7%) and Plaster and Whitewash (-0.2%) have all registered falls in their inter-annual rates (July 2003-July 2004).